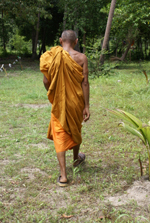 Walking meditation can be a very powerful practice and is a wonderful way to help concentrate the mind. It has been used in monastic traditions for centuries and is especially helpful when the mind is restless. 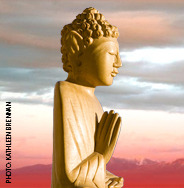 It is often done in conjunction with a rotation of sitting and walking meditations on retreats. Select a level place, indoors or outdoors, where you can walk in a straight direction for about 100 feet or so. In conjunction with each footstep, you silently note the count. For example; the first step is one, the second step is one-two, the third step is one-two-three, the fourth step is one-two-three-four, and so on until you reach the count of ten. Then, pause for a moment and reverse your direction and the counting. For example; ten, ten-nine, ten-nine-eight, ten-nine-eight-seven, descending back to one. The practice can be repeated in a walking session for as long as you want. It is a good technique to free the mind from other thoughts and it can be done at a slow or moderate pace.